A recently released report from the Russian Interior Ministry showed two major trends on Russian roads in 2013. According to statistics, traffic accidents as a result of drunk driving declined throughout the year, but at the same time, the overall number of traffic violations was up. According to a combined statistical report published by the Russian traffic police service, 68.2 million road traffic violations were registered in 2013, up 4.7 percent over the previous year. Business daily Kommersant reported that motorists paid a total of just over $1 billion in fines. According to the traffic police service, speed cameras caught 35 million speeding violations – up 22 percent from 2012. 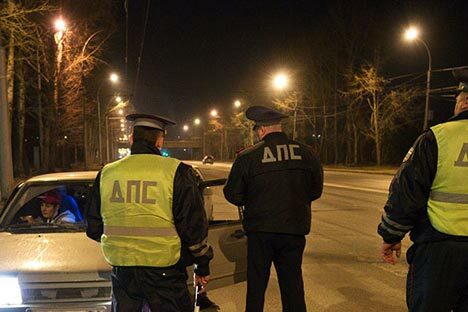 Vyacheslav Lysakov, a State Duma Deputy who works on legislation related to drivers said the increase in speeding violations is partly due to the growing number of cars on the roads: "Every year the number of drivers increases by 2.5 million," Lysakov said. The report also showed that 590,200 cases of drunk driving were registered in 2013, down 3.4 percent year-on-year. In the last four months of 2013, the number of drunk-driving incidents fell dramatically – by 14.8 percent. Lysakov said that stricter punishments for drunk driving played a role in the decrease. In August 2013, a rule came into force establishing a maximum allowable blood alcohol level, which means that not all of those pulled over on suspicion of drunk driving were fined. Additionally, in September, a regulation came into force that fines and strips drunk drivers of their licenses at the same time. “The notion of possible accumulated margin of error has been introduced,” Lysakov said, speaking about the first law. Lysakov noted that motorists could expect tougher laws soon. "Under the planned amendments, drunk driving might even become a criminal offense," he said. Viktor Travin, president of the Committee for Motorists' Rights Protection, is not convinced that the decrease in drunk driving and the increase in overall violations are unrelated. "It is hard to believe the statistics, because traffic police officers are now being replaced with speed cameras, but the equipment can only measure the speed of a vehicle, it cannot test the driver for alcohol,” Travin said. “A lot depends on the number of inspectors on the roads. The figures give an indication of the work done by traffic police but say nothing about the drivers. I have talked to traffic police officers; they say the number of drunk driving motorists on the roads has not declined."